Kentucky Transportation Cabinet (KYTC) will remain the entitlement sponsor of the NASCAR Gander Outdoors Truck Series race at Kentucky Speedway. 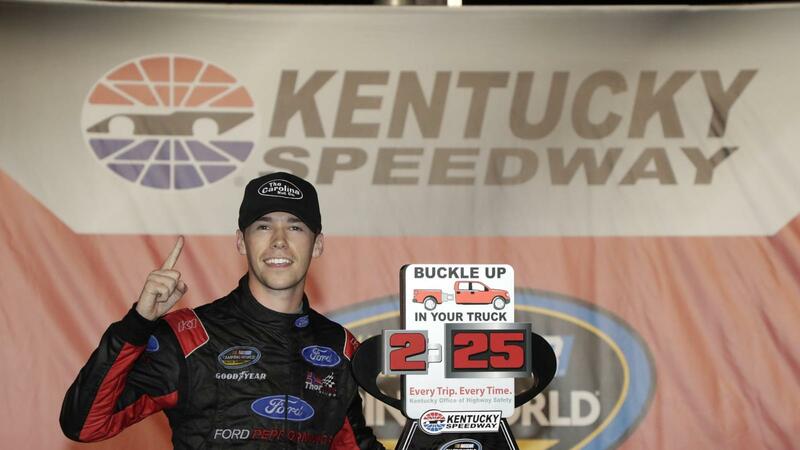 The speedway's continued partnership with KYTC is centered on the "Buckle Up in Your Truck" (BUIYT) campaign to bring awareness to seatbelt use in pickup trucks. The Buckle Up in Your Truck 225 will kick off a NASCAR tripleheader weekend on Thursday, July 11. "Ben Rhodes coming back to defend his victory in last year's BUIYT 225 will be one of the highlights of this year's tripleheader weekend. We are proud to extend our long standing partnership with KYTC and work together to save lives on the highways of the Commonwealth," said Kentucky Speedway General Manager, Mark Simendinger. The Kentucky Office of Highway Safety's BUIYT campaign, an aspect of safety within the Transportation Cabinet, works in conjunction with the "Click It or Ticket" program. Research has found that drivers and occupants of pickup trucks are less likely to use their safety belt than in any other type of vehicle. By using the Gander Outdoors Truck Series race as a platform, the goal is to increase public awareness of the lack of safety belt use in pickup trucks, educate drivers to buckle up and diminish fatalities. In Kentucky, the seat belt usage rate for pickup trucks is 80 percent, compared to 92 percent for passenger cars. While rollover crashes can happen in any type of vehicle, pickup trucks are twice as likely to rollover as passenger cars. In addition, pickup truck drivers have the lowest level of seat belt use among drivers of all other vehicles nationwide. "We appreciate the Kentucky Speedway's continued partnership in promoting our highway safety messages," said Acting Executive Director Jason Siwula. "As we gear up for racing season, we're proud to bring attention to this critical highway safety issue and encourage NASCAR fans to make smart decisions each and every time they get behind the wheel,"
Of the 722 fatalities on Kentucky roadways last year, 220 involved a pickup truck. "Wearing a seat belt gives you the best chance to survive a crash," said Siwula. "NASCAR drivers always buckle up before starting their engines. We're asking NASCAR fans to do the same." Fans are able to purchase season tickets and camping, July weekend packages or individual race tickets now by calling (859) 578-2300 or visiting the Kentucky Speedway ticket office at 1 Speedway Drive, Sparta, Ky., 41086 just off Interstate 71 at Exit 57 and Ky. Hwy. 35 North. Ticket office hours are 9 a.m. to 5 p.m. Monday through Friday.